NTT Com Asia (NTTCA) proposes to install a telecommunication cable (Asia Submarine-cable Express (ASE) cable) of approximately 7,200 km in length, connecting Japan and Singapore with branches to the Philippines, Hong Kong SAR (HKSAR) and Malaysia. A Project Profile (PP-452/2011) which includes an assessment of the potential environmental impacts associated with the installation of the submarine telecommunications cable system was prepared and submitted to the Environmental Protection Department (EPD) under section 5. (1)(b) and 5. (11) of the Environmental Impact Assessment Ordinance (EIAO) for the application for Permission to apply directly for Environmental Permit (EP). The Environmental Protection Department, subsequently issued an Environmental Permit (EP- 433/2011). This is the Ninth Weekly Site Inspection Report that presents the findings of the site inspection and other EM&A activities undertaken during the period from 26 November 2012 to 2 December 2012. A weekly joint environmental site inspection was carried out by the representatives of the Contractor and the Environmental Team (ET). Environmental performance complied with the environmental requirements and all necessary mitigation measures were properly implemented. Daily marine mammal exclusion zone monitoring was not carried out in the reporting period as the cable installation works in Zone C and from C to the boundary of HKSAR waters were completed on 24 October 2012. No non-compliance with PP recommendations, EP conditions and other requirements associated with the construction of the Project was recorded in the reporting period. No environmental complaint was received in this reporting period. No environmental summons was received in this reporting period. Works to be undertaken in the coming reporting period would include beach manhole construction and land duct laying works. Potential environmental impacts arising from these construction activities are mainly associated with dust, construction noise and waste management. For the submarine cable installation part, cable laying works will continue to be conducted in China waters, which are out of the scope of the current EM&A. 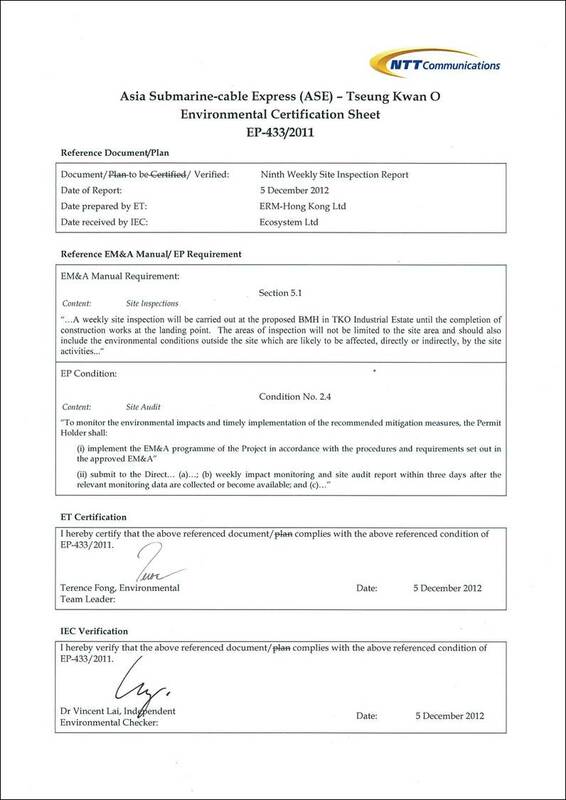 ERM-Hong Kong, Limited (ERM) was appointed by NTT Com Asia (NTTCA) as the Environmental Team to conduct regular site inspections and audit the implementation of all environmental monitoring and mitigation measures recommended in the Project Profile (PP) (Register No. 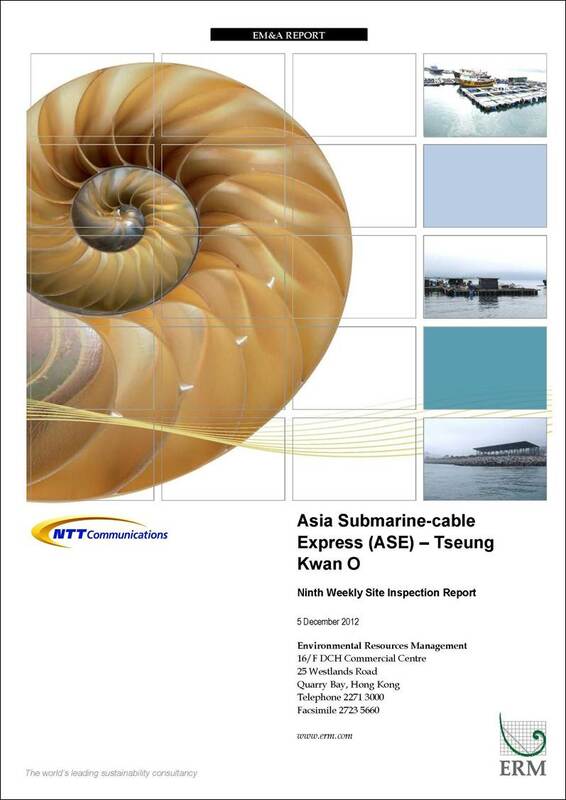 PP – 452/2011) for the Proposed Asia Submarine-cable Express (ASE) – Tseung Kwan O (the Project). 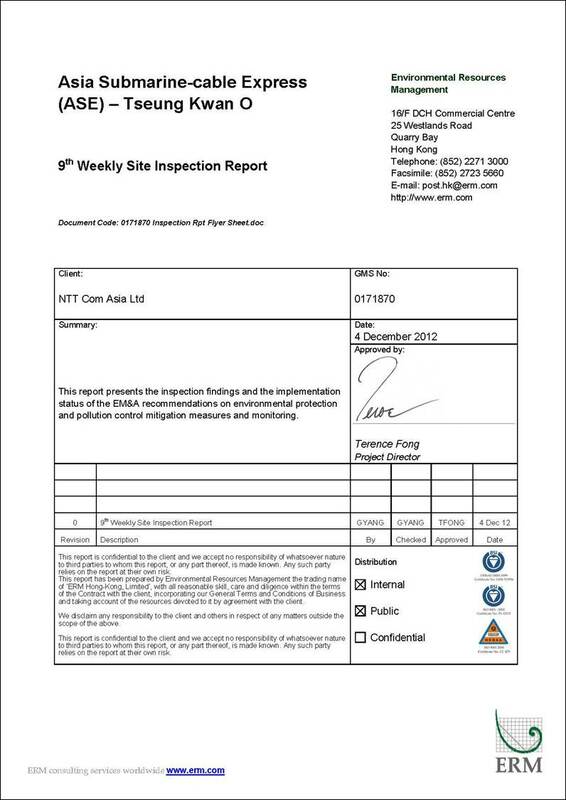 This is the Ninth Weekly Site Inspection Report (the Report), which summarises the inspection findings for the period from 26 November 2012 to 2 December 2012 and the implementation status of the EM&A recommendations on environmental protection and pollution control mitigation measures and monitoring. Details the scope and structure of the Report. Summarises background and scope of the Project, site description, construction programme, the construction works undertaken and the status of Environmental Permits/Licenses during the reporting period. Summarises the monitoring programmes as recommended in the PP and the monitoring undertaken during the reporting period. Summarises the findings of the weekly site inspection undertaken within the reporting period. Summarises any exceedances of environmental performance standard, environmental complaints and environmental summons received within the reporting period. Summarises the impact forecast and monitoring schedule for the next reporting week. NTT Com Asia (NTTCA) proposes to install a telecommunication cable (Asia Submarine-cable Express (ASE) cable) of approximately 7,200 km in length, connecting Japan and Singapore with branches to the Philippines, Hong Kong SAR (HKSAR) and Malaysia. NTTCA is responsible for securing the approval to land the ASE cable in Tseung Kwan O, Hong Kong SAR (HKSAR). The proposed landing site will be at a new Beach Manhole (BMH) and ultimately connect with a Data Centre in Tseung Kwan O (TKO) Industrial Estate which is scheduled for completion in 2012. From Tseung Kwan O, the cable will extend eastward approaching the Tathong Channel. Near to Cape Collinson, the cable is approximately parallel to the Tathong Channel until north of Waglan Island where the cable travels eastward to the boundary of HKSAR waters where it enters the South China Sea. The total length of cable in Hong Kong SAR waters is approximately 33.5 km. A map of the proposed cable route is presented in Annex A. A Project Profile (PP-452/2011) which includes an assessment of the potential environmental impacts associated with the installation of the submarine telecommunications cable system was prepared and submitted to the Environmental Protection Department (EPD) under section 5. (1)(b) and 5. (11) of the Environmental Impact Assessment Ordinance (EIAO) for the application for Permission to apply directly for Environmental Permit (EP). The Environmental Protection Department, subsequently issued an Environmental Permit (EP- 433/2011). Under the requirements of Condition 2.4 of the EP, an EM&A programme as set out in the revised Environmental Monitoring and Audit Manual (EM&A Manual) is required to be implemented. The EM&A programme includes water quality monitoring, marine mammal observation, coral monitoring and weekly site inspection. The location of the cable installation works within the boundary of Hong Kong SAR waters is shown in Annex A, while the location of the landing point (ie new Beach Manhole (BMH) in TKO Industrial Estate) is shown in Annex B. The preliminary construction programme of the Project is given in Figure 2.1. Starting from 8 October 2012, the submarine-cable laying works in Zone A, Zone B and Zone C have been largely finished and the installation barge reached the boundary of Hong Kong marine waters on 24 October 2012. The post-installation cable protection work will be performed for Zone A and Zone B at the later construction stage. The construction works of the landing point commenced on 4 October 2012 and are temporarily scheduled to be completed in early December of 2012. A summary of the major construction activities undertaken on the landing point during the reporting period is shown in Table 2.1. · Reinstatement for the completed part of land duct. A summary of the relevant permits, licences, and/or notifications on environmental protection for this Project is presented in Table 2.2. Baseline water quality monitoring was completed by the end of September 2012. Baseline Water Quality Monitoring Reports for Zone A, Zone B and Zone C were submitted on 19 September 2012, 25 September 2012 and 1 October 2012, respectively. Daily impact water quality monitoring was not conducted in the reporting period as no cable laying works in Zone A, Zone B and Zone C were involved from 26 November 2012 to 2 December 2012. Daily marine mammal exclusion zone monitoring is required to be conducted during the cable installation works taking place in daylight hours along the sections outside Zone A to Zone B (ie Zone C and from C to the boundary of HKSAR waters). This monitoring was not carried out in the reporting period as the cable installation works in Zone C and from C to the boundary of HKSAR waters were completed on 24 October 2012. Baseline coral monitoring was completed in September 2012. The Baseline Coral Monitoring Survey Report was submitted on 28 September 2012. Post-project coral monitoring will be conducted within one month after completion of the jetting works, with the Post-project Coral Monitoring Survey Report to be submitted within one month after completion of the marine works. Impact monitoring for coral during cable installation works is not required under the Project. In the week of 8 October 2012 when the cable installation barge passed the identified coral communities as presented in the Baseline Coral Monitoring Survey Report, the nearest distances between the barge and the identified coral communities in Zone A and Zone B were 230m and 270m respectively, indicating the cable alignment of more than 180m away from the identified coral communities as required in the Environmental Permit (EP- 433/2011). In accordance with the revised EM&A Manual, a weekly site inspection should be undertaken at the landing point (ie new Beach Manhole (BMH) in TKO Industrial Estate) to ensure that the appropriate environmental protection and pollution control mitigation measures are properly implemented in accordance with the Project Profile (PP-452/2011). Results of the site inspection in the reporting period are provided in Section 4. The weekly site inspection is required to be carried out by the representatives of the Contractor and the Environmental Team (ET). A Site Inspection Log is completed by the ET representative to record whether the Contractor is compliant with environmental regulations in terms of noise, water quality and housekeeping etc (Annex C). (i) A copy of EP was displayed conspicuously at the vehicular site entrance in accordance with the requirement of Condition 1.5 of the EP. (ii) Middle section of the land duct was completed. For the completed part, excavated materials have been backfilled into the trench and the site has been reinstated to its original status (Annex D Photo No. 1). (iii) Impermeable sheets were observed to have been placed in some portions of the stockpiles of excavated soils and rocks, but large portion of stockpiles were still exposed under the rain (Annex D Photo No. 2). The Contractor was reminded to cover all stockpiles completely during rain events to prevent storm runoff, which would transport the sediment and eventually deposit it in nearby sea water, storm drains or low-lying areas. No non-compliance of PP/ EM&A/ EP/ legislative requirements was recorded during the reporting period. No complaint was received during the reporting period. No summons was received during the reporting period. Works to be taken for the next reporting period are summarised in Table 6.1. Potential environmental impacts arising from the above construction activities are mainly associated with dust, construction noise and waste management. Impact water quality monitoring would be resumed should hand jetting works involved in the post-installation works be carried out in Zone A and Zone B. The results (if any) will be summarised in the Third Weekly Water Quality Impact Monitoring Report after the relevant monitoring data become available. Next weekly site inspection is temporarily scheduled on 7 December 2012. This Ninth Weekly Site Inspection Report presents the findings of the site inspection and other EM&A activities undertaken during the period from 26 November to 2 December 2012, in accordance with the PP (Register No. PP – 452/2011), revised EM&A Manual and the requirements of Environmental Permit (EP- 433/2011). No impact water quality monitoring was carried out in the reporting week and neither was the daily marine mammal exclusion zone monitoring, as the cable installation works were conducted in China waters in the reporting week. A weekly joint environmental site inspection was conducted on 29 November 2012 during the reporting period. It confirmed that the environmental mitigation measures recommended in the PP were properly implemented by the Contractor. No non-compliance event was recorded during the reporting period. No complaint and summons/prosecution was received during the reporting period. The ET will keep track on the construction works to confirm compliance of environmental requirements and the proper implementation of all necessary mitigation measures.